So you’ve just driven for an hour and a half, with the anticipation of hitting the hatch of your life along with large numbers of big, hungry fish. Finally you reach the river and “SURPRISE!” The water’s two feet higher than last week and “off color”, “stained”, “tea” or “chocolate milk colored”. Whatever “colorful” terms you choose to use to describe the disappointing sight spreading out in front of you, the fact remains that it hasn’t rained for a week, so this is obviously the result of a nearby dam release. Believe it or not, all is not lost and a rewarding fishing experience may still be on the day’s agenda, so don’t pack up and go home yet. Remember that whether the water’s rising or falling, all the fish want is food and cover and to use the least amount of energy possible to get them. I’ll refer to two different tailwater fisheries, the West Branch of the Delaware and the Lehigh River to illustrate some of the conditions you might encounter. The Delaware River Club, our home, is located on the West Branch of the Delaware which is subject to unpredictable dam releases from the Cannonsville Reservoir. As with other tailwater fisheries, our anglers are sometimes faced with drastic water level changes and many just don’t know how to deal with them. One of the most common questions asked of the staff here is, “How does the change in water levels affect the fishing?” Over the years the Delaware River Club guides and I have had to deal with this challenge and have found some solutions to finding fish in this continually changing habitat. There are certain environmental factors that need to be taken into consideration when determining a fishing strategy on tailwaters that are experiencing drastically rising and falling water levels. Water temperature, clarity, current, and available structure for cover are all factors that will change during releases, each of which will in some way impact the fish’s behavior and feeding habits. Temperature not only impacts the fish’s metabolism, but also the fish’s food supply. On the West Branch of the Delaware one of the most notable changes during rising water is the overall temperature of the fishery. During the summer months, the average flow temperatures in the lower West Branch, several miles from the dam, may be in the high 50’s to the mid 60’s. When water is being released to help meet the targeted water flows on the Main Stem the water may rise 400 cfs to 800 cfs in a matter of hours and drop the water temperatures to 45 to 55 degrees throughout the entire river. This temperature shock slows the trout’s metabolism down and makes fishing tough for a few hours until the fish get accustomed to the cooler water conditions. There is, however, a bonus to this additional cold water. Insect hatches, which would normally occur later in the evening and into the dark, start earlier in the day, giving fishermen the opportunity to enjoy the entire hatch. When the water level drops it allows the West Branch to warm up again in the lower sections. The fish resume their normal feeding schedules and the hatches on the lower river become morning and evening hatches, instead of midday events. On rivers like the Lehigh River, the temperature changes are not quite as radical and do not impact the timing of the hatches. Water clarity has a big impact on visibility and can actually give the fish the upper hand. On the West Branch, the rising water may occasionally look like tea, but it remains relatively clear throughout the release and clears up fast, even before the water recedes. Unlike the West Branch, the rushing water on the Lehigh churns up the bottom and bank side debris and degrades the clarity of the water, resulting in “coffee hold the cream color” water. The muddy water may delay hatches a little bit and the fish tend to shut off and wait for the levels to stabilize and begin to clear. As the water recedes and clears on both streams it gives the fish a little more time to inspect the flies. They can see a poorly presented imitation a mile away. This is definitely not the time to be lax with presentation techniques. A lighter and longer tippet may also be called for in this situation to get a better drift to entice a take from a wary trout. Fish have a strong desire to conserve energy and the current strongly influences their behavior during releases. Rising water from releases causes fish to look for slower currents so that that they don’t have to expend as much energy to stay in an area. They may change their lies and move out of the main current in the channels and prime areas to the more protected edges of the river near the banks and back eddies. We have noticed that when the water is high we tend to see more “bank feeders”. These are trout clinging tightly to the bank and rising to insects floating in the currents. Many times they are barely visible due to the surface disturbance along the bank. In this situation the fish have plenty of oxygen, food, and cover and do not have to hold in the deeper, faster water for these crucial needs. There are sometimes pods of fish feeding in an area in the high water, but the populations of fish are not as concentrated as in low water conditions. Some anglers believe that the fish may actually become more active for a short period of time as the water starts to rise. Although I personally haven’t seen an increase in fish activity during these times and prefer to fish the drop, some anglers theorize that as the water level is rising, the fish become opportunistic and feed on the aquatic and terrestrial morsels that are being dislodged and washed into the stream. I won’t venture an opinion on that, but I would suggest that the most productive fishing strategy in these water conditions is to find and focus on the active fish in the system. We often use the opportunity of rising and stained water to pound the banks from the comfort of a drift boat. We use large streamers to catch fish that are taking advantage of the current break and cover provided by the shoreline. After the water has stabilized at its peak level and the fish have become accustomed to the conditions they will tend to spread out throughout the pools and runs. And once the river has cleared and the levels have stabilized the fish will often start to feed with some regularity. Those occasionally rising fish will typically be joined by other fish in the hours to come. This is also a good time to use streamers and wet flies to cover the water. As the water drops again the fish slowly settle back into their pre-release feeding lanes and return to their normal habits. The fish also move along with the available cover. As the water level drops and the banks become shallow, no longer offering protection from predators, the trout will leave those areas and return to the main current seeking out the prime lies for safety and food. The fish become more concentrated, since there is less water, as they settle back in to the more obvious feeding lanes, pools and runs. A change in fishing tactics to nymph or dry fly fishing during the non-hatch periods can be very productive as well as concentrated efforts in the heads of the pools or sections of the river that have a bit more current and current seams. If there is sporadic hatching, blind casting dry flies with traditional “match the hatch” techniques or casting attractor patterns may be fruitful. This is also a great time to mentally map the geography of the river bed, looking for areas that might offer cover when the water rises again. It often pays to stick it out on a stream that is at one of it’s extremes in order to find out where the fish are taking up residence. Fishing a tail-water fishery on a regular basis reveals a pattern in fish behavior during the release and dropping periods. 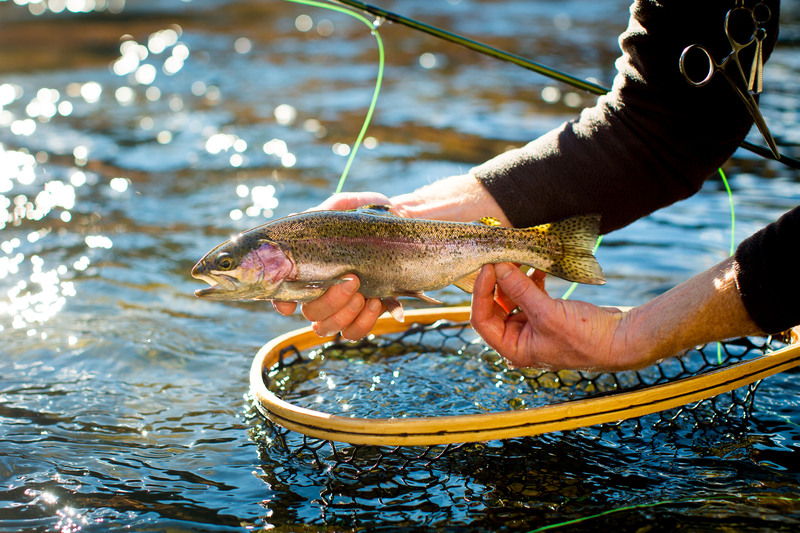 Trout will often move consistently from one lie to another depending on the water conditions. If you get to the river and it is at its low, then the river will reveal its best cover and its channels. Make notes of all the deep channels and cuts that may hold fish, you may need them later. Prime lies will often hold fish no matter what the levels are. In the lower water levels remember nymph fishing and dry flies will take most of the fish, but they may be more selective and a more precise presentation may be needed. There are lessons to be learned no matter what conditions you may encounter. These days we spend a lot of time using the science from USGS water surveys and river reports to help us make the decision on where and how to fish. Just remember time on the river will teach you far more than that computer ever will.